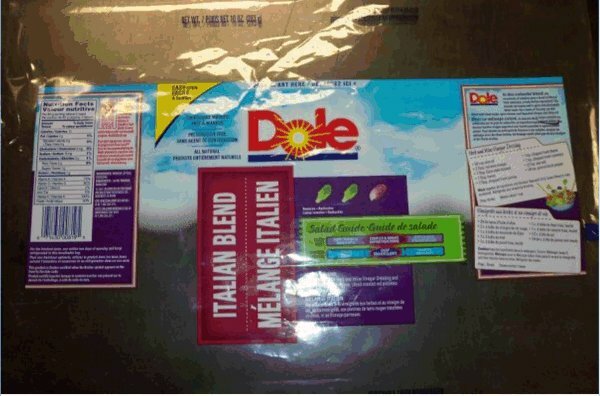 Dole Fresh Vegetables Inc. is recalling Dole brand Italian Blend salad from the marketplace due to possible Listeria contamination. Regarding Dole Fresh Vegetables Inc.‘s recall, the details are as follows. This product is known to have been distributed in Ontario, Quebec and New Brunswick and may have also been distributed in other provinces. Please check to see if you have the recalled product in your home. This recalled product should be thrown out or returned to the store where they were purchased. Dole Food Company : 800-356-3111 (open 8:00 am to 3:00pm (PDT) Monday-Friday). Company / Firm: Dole Fresh Vegetables Inc.
Ottawa, March 12, 2014 – Dole Fresh Vegetables Inc. is recalling Dole brand Italian Blend salad from the marketplace due to possible Listeria contamination. Consumers should not consume the recalled product described below. The following product is known to have been distributed in Ontario, Quebec and New Brunswick and may have been also been distributed in other provinces. Compagnie / entreprise: Dole Fresh Vegetables Inc.
Ottawa, le 12 mars 2014 – Dole Fresh Vegetables Inc. rappelle la salade Mélange italien de la marque Dole, qui pourrait être contaminé par Listeria. Le produit rappelé décrit ci-dessous ne doit pas être consommé. Le produit a été distribué en Ontario, au Québec et au Nouveau-Brunswick et il pourrait avoir été distribué dans d’autres provinces.